A recently released report found Rep. Tulsi Gabbard (D., Hawaii) is closely tied to Hindu Americans who favor Indian Prime Minister Narendra Modi and are connected to Hindu nationalist organizations in India. "In the United States, Modi’s reputation has been helped by a group of Hindu-American supporters with links to the [Rashtriya Swayamsevak Sangh, or RSS] and other Hindu nationalist organizations, who’ve been working in tandem with a peculiar congressional ally: Rep. Tulsi Gabbard, D-Hawaii, the first Hindu in Congress," the Intercept reported Saturday. In 2002, when Modi was chief minister of the state of Gujarat, he oversaw an outbreak of violence by Hindu nationalists against the minority Muslim population that resulted in the deaths of more than 1,000 people. Local and international fact-finding groups accused Modi of complicity in the killings, charging that he did not do enough to contain the violence. Indian courts eventually exonerated him for a lack of evidence, but his image was pilloried. The United Kingdom and some European countries refused to deal with him and in 2005, the United States barred him from entering the country. multireligious society remained threatened by an increasingly exclusionary conception of national identity based on religion." A group of several hundred Modi supporters met in Atlanta after he was elected in 2014 and called for donations to Gabbard's reelection campaign, according to the Intercept. The event was organized by an organization called Overseas Friends of the BJP, which had observed Gabbard's opposition to 2013's House Resolution 417. The resolution called on India "to protect ‘the rights and freedoms of religions minorities' and referred to incidents of mass violence against minority Muslims that had taken place under Modi’s watch." 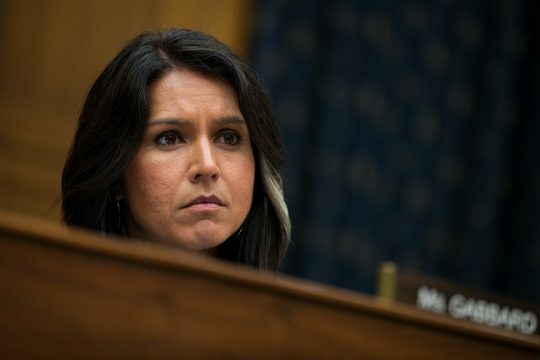 An Intercept analysis of Gabbard's financial disclosures since 2011 found "dozens of [her] donors have either expressed strong sympathy with or have ties to the Sangh Parivar — a network of religious, political, paramilitary, and student groups that subscribe to the Hindu supremacist, exclusionary ideology known as Hindutva." Current and former members of Sangh affiliates in the U.S. have donated "hundreds of thousands of dollars to Gabbard’s campaigns since 2011." Gabbard has attended conferences organized by Sangh affiliates such as the Vishwa Hindu Parishad of America (VHPA), "whose counterpart in India has been linked to advocating violence against Muslims in India and was classified last summer as a ‘militant religious organization' in the CIA World Factbook," although the BJP has argued against this classification. Bharat Barai, a member of the VHPA's advisory board, told the Intercept that Sangh affiliates in the U.S. try "to work within the bounds of law" and are separate from their counterparts in India. Last year, Gabbard withdrew from the World Hindu Congress, a conference organized by the VHPA and RSS, after announcing in November 2017 she would chair it. She cited "ethical concerns and problems that surrounded my participating in any partisan Indian political event in America." Nevertheless, after winning reelection in November, Gabbard met with Barai and another prominent Hindu American on Capitol Hill. They reached a "happy consensus" to put the conference behind them, according to Barai. Shortly after, he said, Gabbard held a conference call with Hindu-American supporters, including the VHPA's president, to discuss a possible presidential run. This entry was posted in Politics and tagged Human Rights, India, Religious Freedom. Bookmark the permalink.